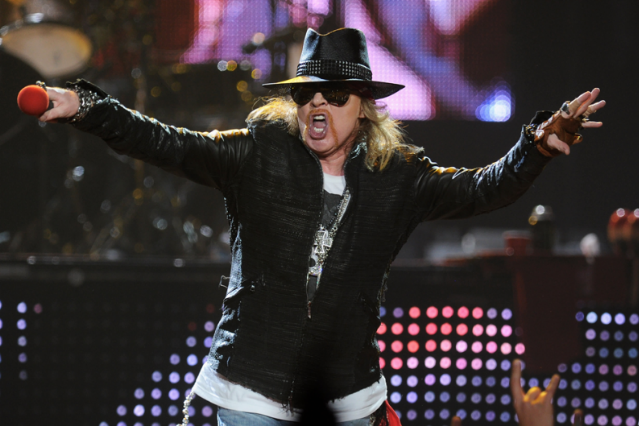 "For the record, I would not begrudge anyone from Guns their accomplishments or recognition for such"
Axl Rose has finally announced how he intends to handle Guns N’ Roses’ Rock and Roll Hall of Fame induction — he’s refusing it altogether. Axl will not attend the ceremony, which will be held this Saturday (April 14) and broadcast on HBO May 5 — furthermore, he will not be inducted, in person or symbolically with the rest of the members of his original lineup at all. Bummer news for GN’R fans, but probably a bit of a relief for the folks doing the inducting, Green Day. In a (very long) open letter sent to and posted by the L.A. Times’ Pop and Hiss blog that may or may not be an attempt to deflect attention from his rumored relationship with Lana Del Rey, Axl airs out his let’s-bury-the-hatchet-but-I-still-hate-you-guys feelings for his former bandmembers, the organizers of the Rock Hall, and generally everyone that has said anything over the past few weeks since the inductees were announced in December (but not, as he notes, “the fans”). Not like we didn’t already know he was obsessed with Slash and the old gang, but now we have 1,038 of Axl’s own words to tell us just how much he “doesn’t begrudge them” the Rock Hall honor but still resents their “misguided attempts to distract from our efforts with [GNR’s] current lineup.” Read the entire, pretty well-written letter below. Axl’s postscript refers to Armand Butts Crump III, a.k.a. ABC III, the Slayer guitar tech who died two weeks ago.